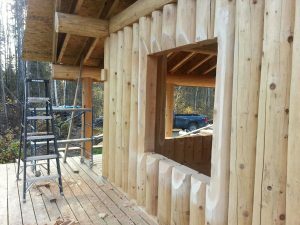 Thinking of building a log cabin? 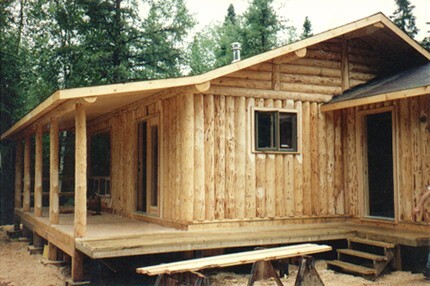 With Log & Timber Works’ Canadiana Vertical Log Cabins, you can be efficient and exquisite at the same time. Thoughtful in using our natural resources while incorporating nature’s strength and wholeness, providing long-term structural integrity and beauty. 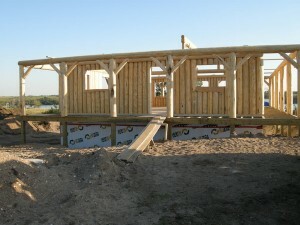 You will even save time and money without compromising quality. 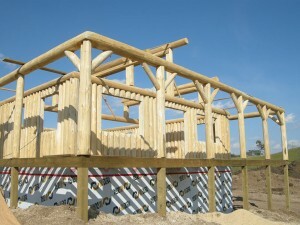 Our signature Canadiana Vertical Log Cabin construction is versatility and design at its very finest. 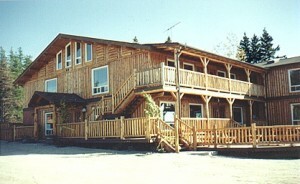 Based on poteaux-sur-sol, the early French-Canadian technique which placed logs in vertical rows, this style boasts simplicity and fast assembly. 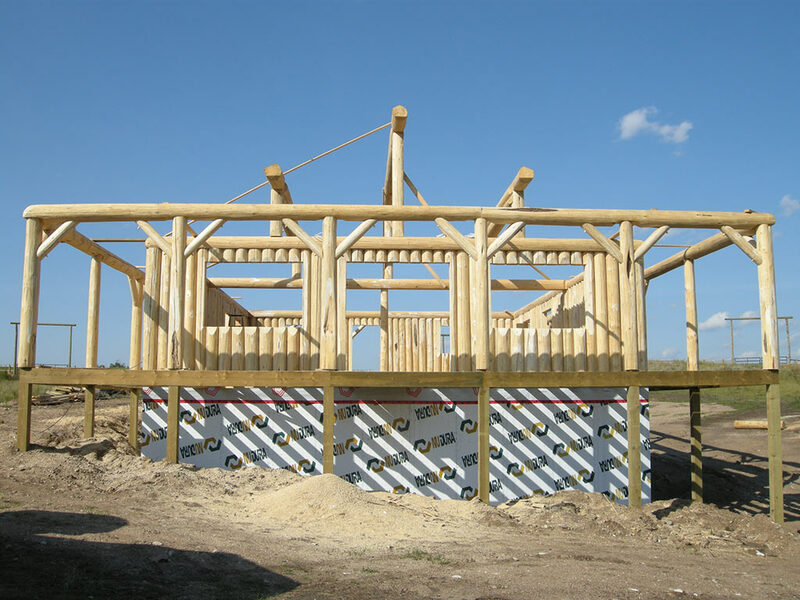 Our long-lasting and esthetically pleasing structures offer exceptional insulation properties. 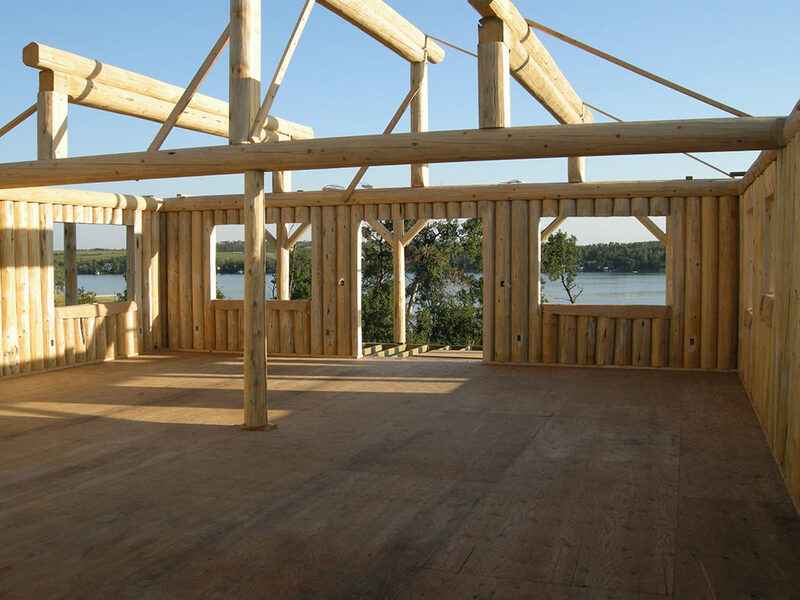 The minimal need for machinery, together with a conscientious use of natural materials, makes our Canadiana Vertical Log Cabins a “green” product you will be proud of. Log & Timber Works’ Canadiana Vertical Log Cabins offer unique advantages, over horizontal log structures, worthy of consideration. 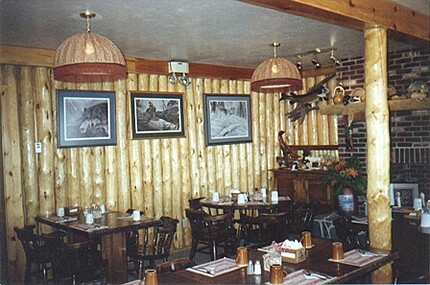 The most salient advantage is cost. 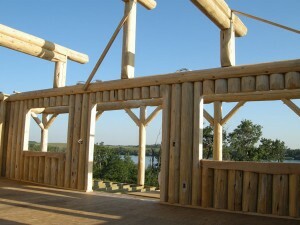 Construction costs of a handcrafted vertical structure are roughly one half of a comparable handcrafted horizontal log building. Due to the conscientious use of smaller diameter logs, along with decreased labour and heavy equipment requirements, expenses are greatly reduced. 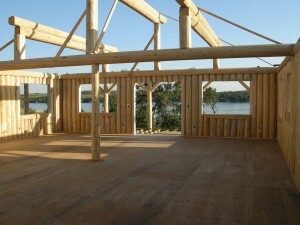 In this method of construction, shorter length logs are stood upright next to one another to create the structure’s walls. 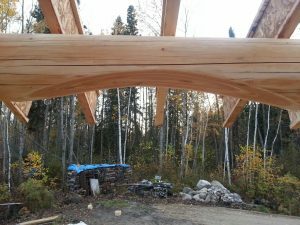 These wall logs are double grooved using a chainsaw and “splined” together with plywood splines. 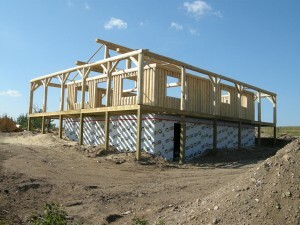 Soft cell foam insulation is placed between the splines for added insulation. 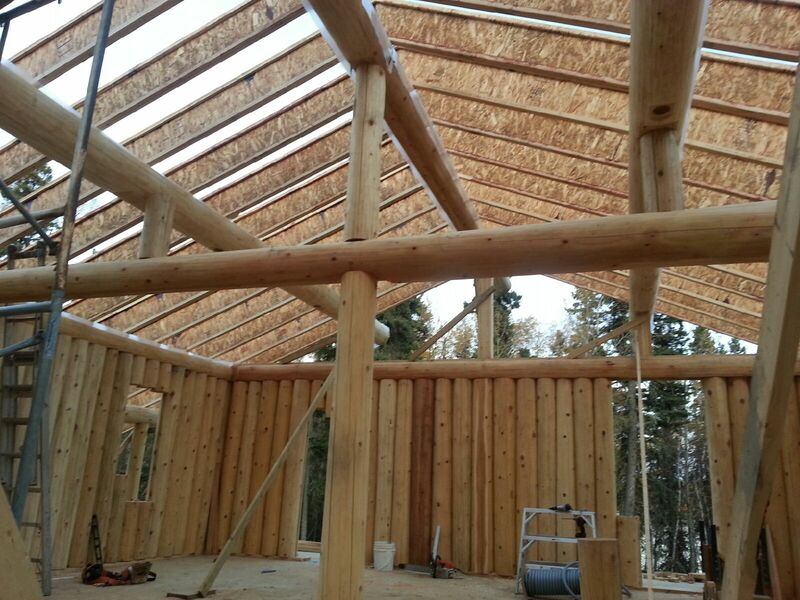 Log & Timber Works’ double splining system ensures a weather-tight building that performs very well in colder climates. 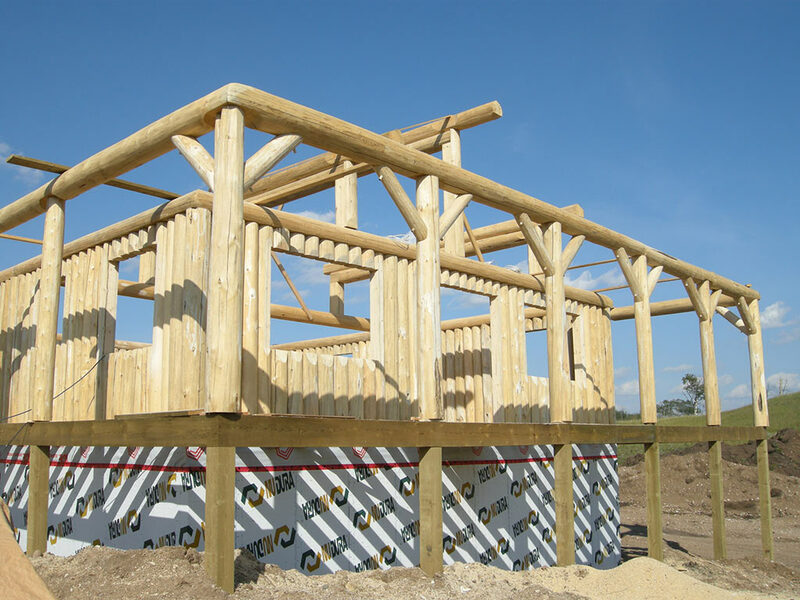 Our vertical log buildings are especially desirable for cabins and cottages; they are more easily transported to, and assembled at, secluded building sites due to the size of materials used. 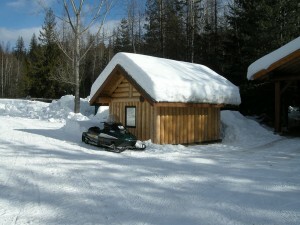 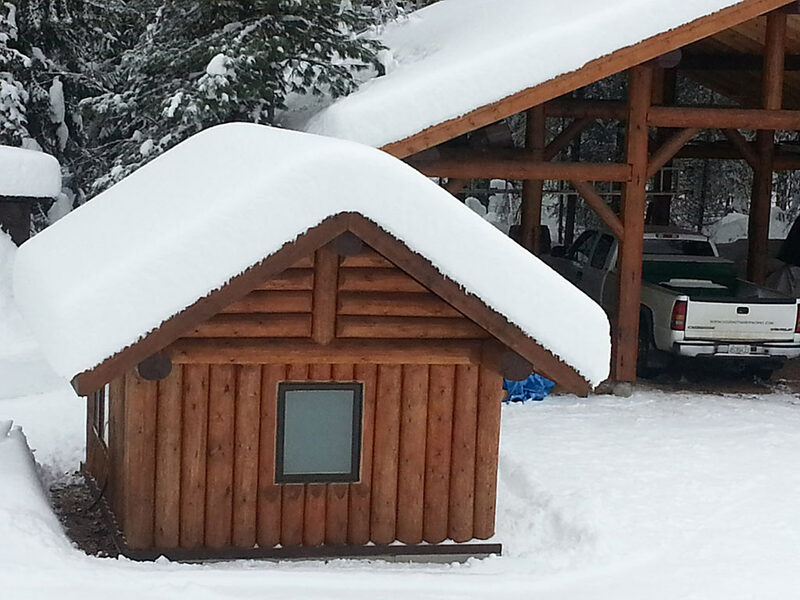 All owners of handcrafted horizontal log structures know that log buildings settle. 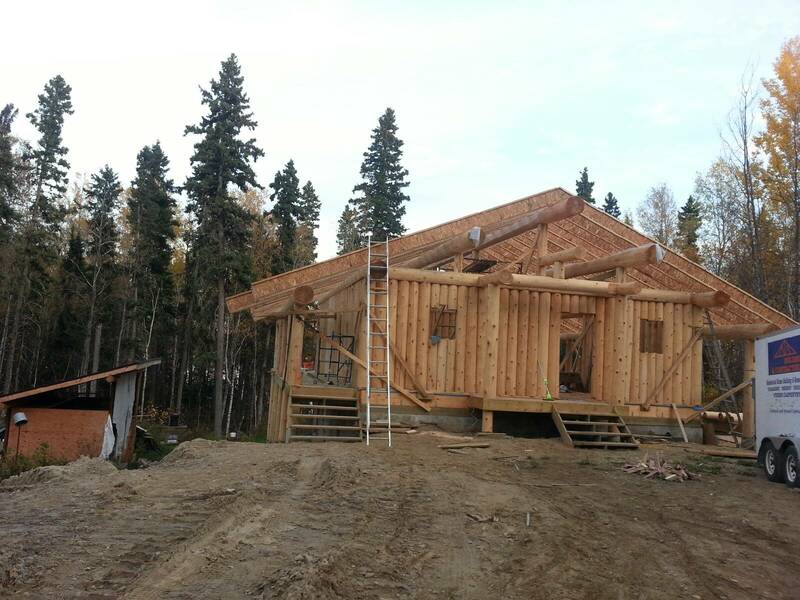 The reason they settle is related to the moisture content of the logs and their subsequent drying. Logs “shrink” across the grain when drying, up to 1/16″ per 10′ length. Logs placed vertically settle a negligible amount, an added advantage of Log & Timber Works’ Canadiana Vertical Log Cabins. 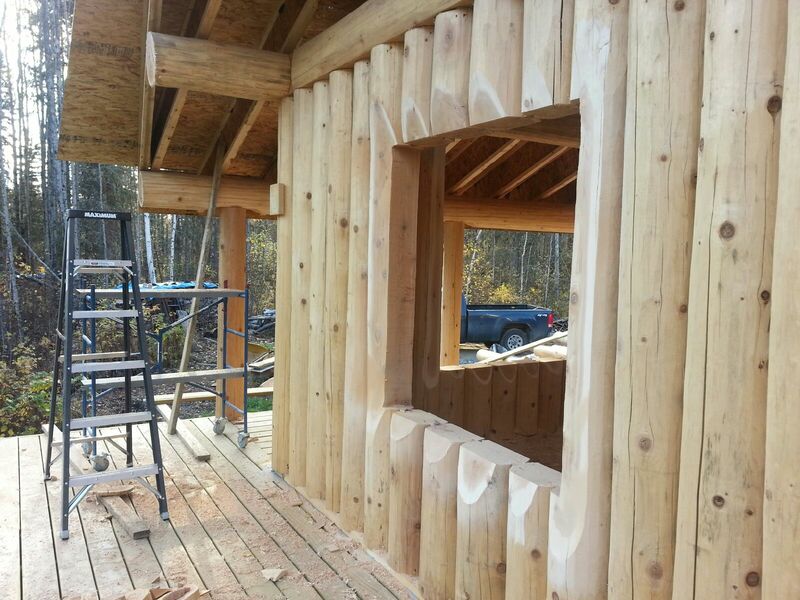 There is no need for special door and window openings to be cut or trimmed to allow for settling of the logs. 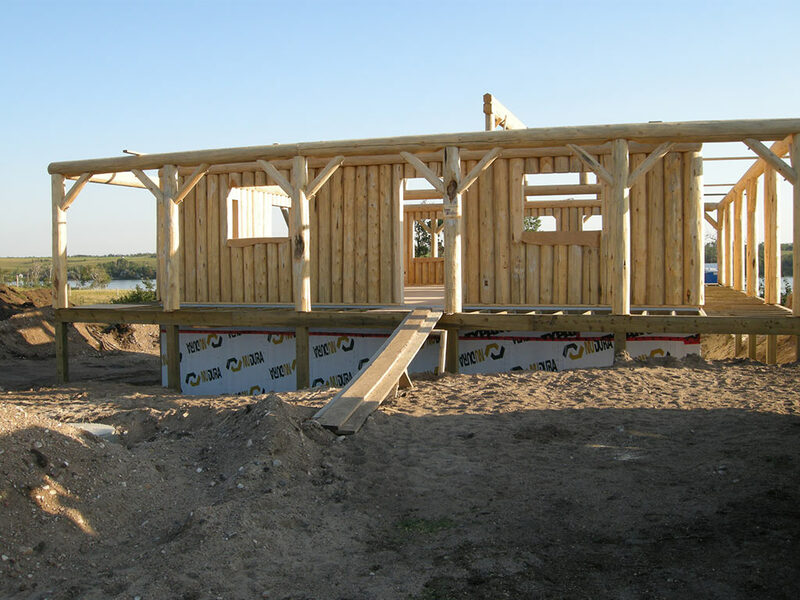 This factor reduces finishing costs and time, making vertical log buildings both affordable and quick and efficient to assemble and finish. 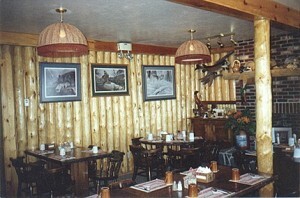 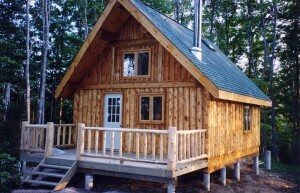 Log & Timber Works’ handcrafted Canadiana Vertical Log Cabins are versatile, cozy and affordable whole log structures. 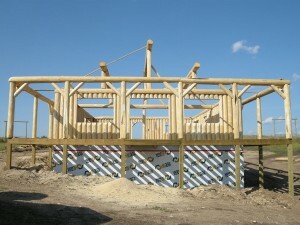 No flattening of the material is performed, outside of the occasional hump or knot. Through thoughtful material selection and planning, all logs used in our Canadiana Vertical Log Cabins reflect their natural size and shape. Our craftsmen offer over two decades of experience handcrafting Vertical Log Cabins. 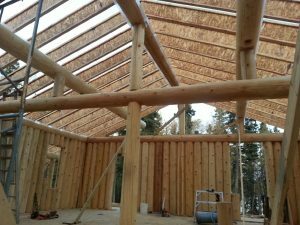 Log & Timber Works will provide all labour required for the assembly of your log package on an existing sub-floor, crawl space or other foundation system which meets your local building codes, providing you with a “carpenter ready” log shell. We will consult with you during the design phase and provide support for your general contractor or sub-trades even after we leave your building site. 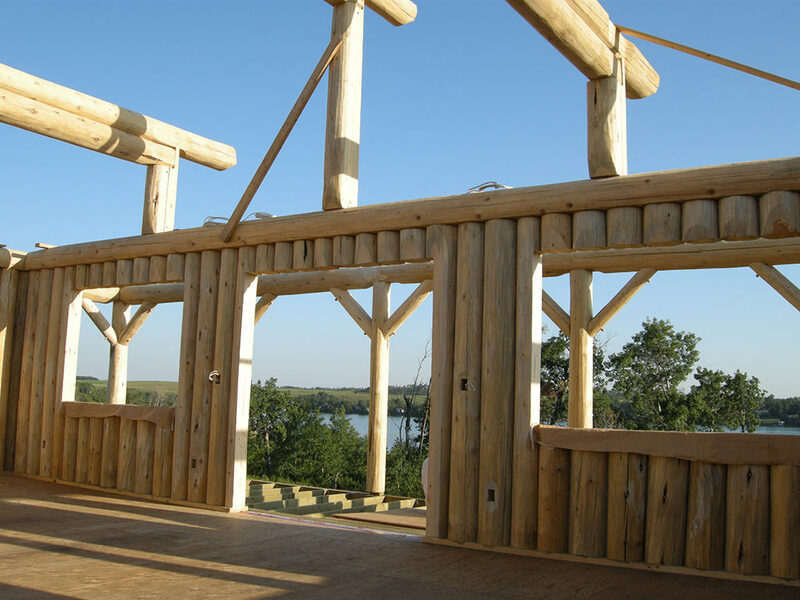 Talk to us today about Log & Timber Works’ Canadiana Vertical Log Cabins.